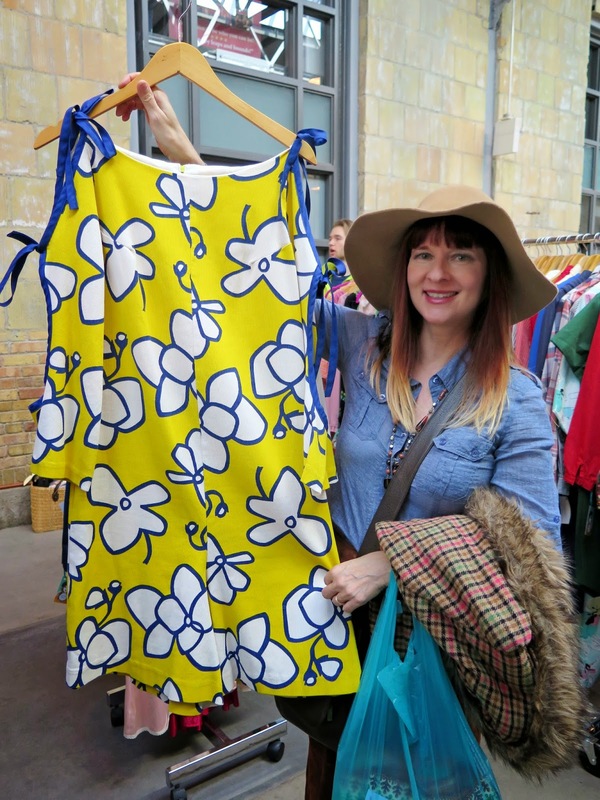 Suzanne and I arranged to meet at Gadsden's Toronto Vintage Clothing Show held at Wychwood Barns this past Sunday. 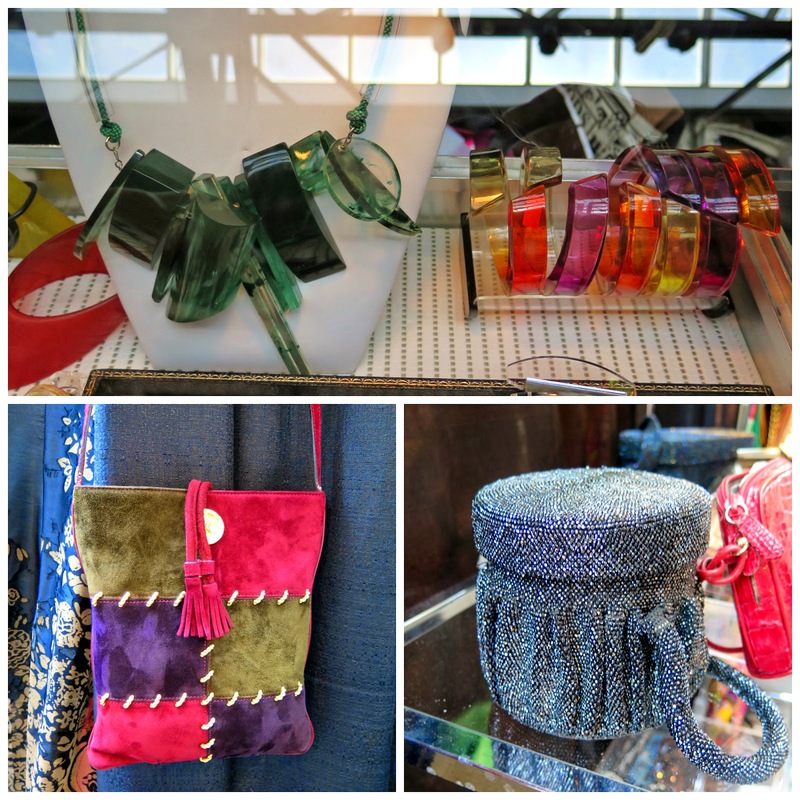 I have attended the show in previous years, but Suzanne had never been, so I thought it would be a good opportunity for some shopping, eating, and yakking, three favourite blogger activities. 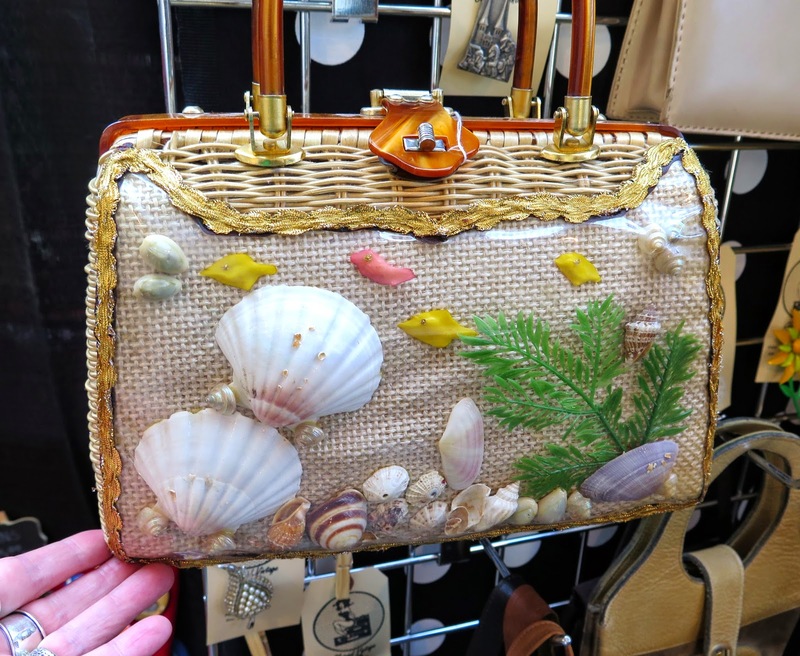 The show is relatively small, with approximately 30 vendors taking part, so it can be covered in a couple of hours. There were floral patterns everywhere, reflecting the long-awaited arrival of Spring (the weather was beautiful - sunny and around 17 degrees celsius). The 1930's dresses on the left are from Emma Paige and unfortunately, I can't remember where the tunic and pants were from. It was a challenge to identify the vendors as very few had signs on their booth and some of them didn't have any business cards. Part of the fun of shows like this is being able to see some of the more unique items that cause you to shake your head and wonder "who the heck wore that??". The quilted (rayon?) two piece with a sailor collar was one of those such items. 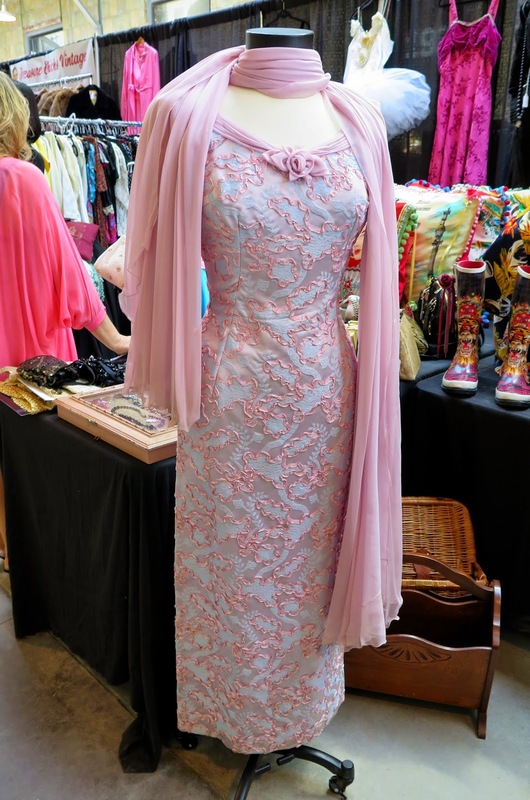 This was from the same vendor that had the green flowered two-piece in the previous photo. (if you're the vendor and see this post, please email me and I will add your name). 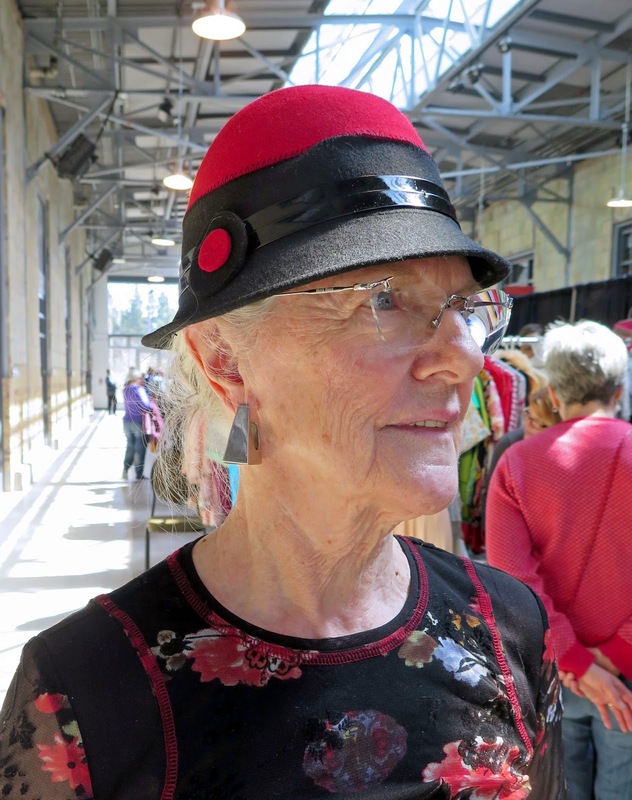 This woman with the striking hat was working at Angela McCool's booth, where she purchased her funky silver earrings. Renee Piche always has great eye candy at her booth and this year was no exception. The three large (horsehair?) flower brooches in the centre are by Hattie Carnegie. 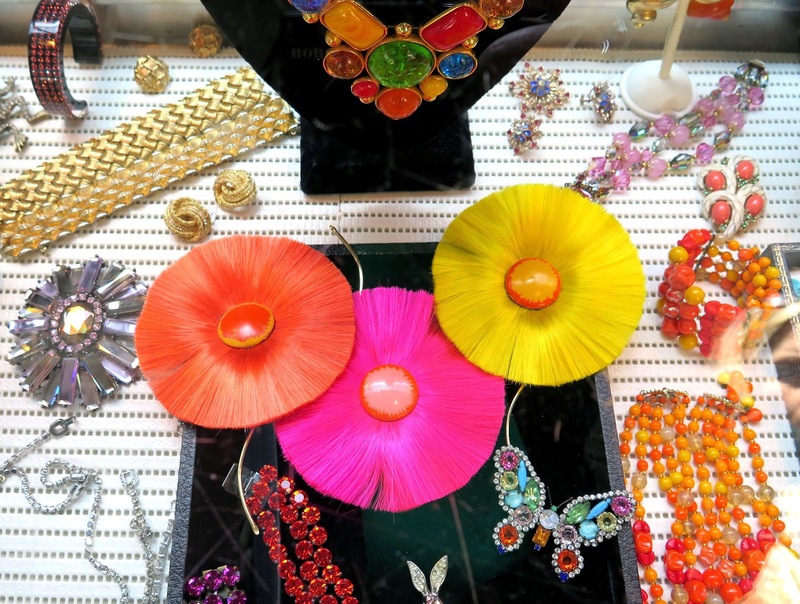 Piche carries a selection of vintage and modern plastic jewellery in fantastic shapes and yummy colours. She also had a few bags, and I particularly liked the sweet multi-coloured suede on on the left and the sparkly blue evening bag on the right. 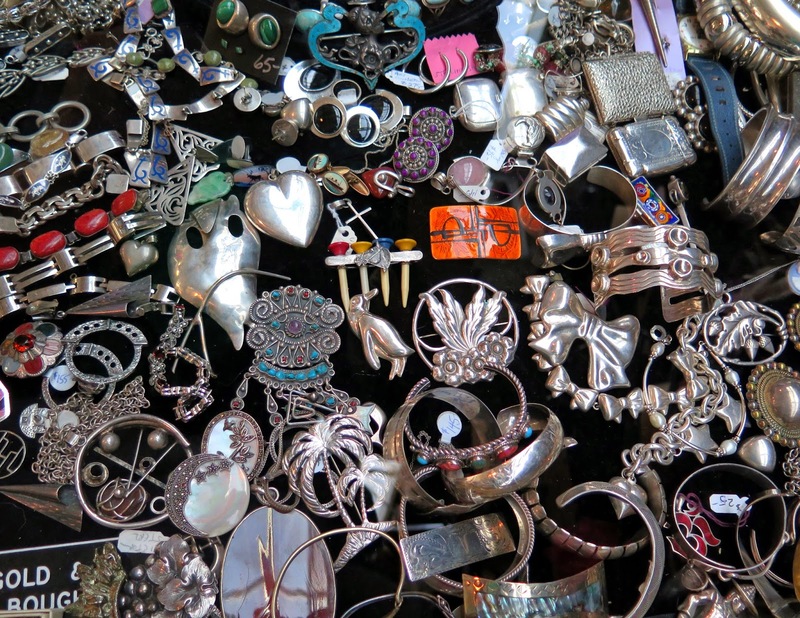 Robin Tillmanns of Factory Girl Vintage had a very unique way of displaying pieces of jewellery at her booth. The photos are all of her mother-in-law at various times of her life. 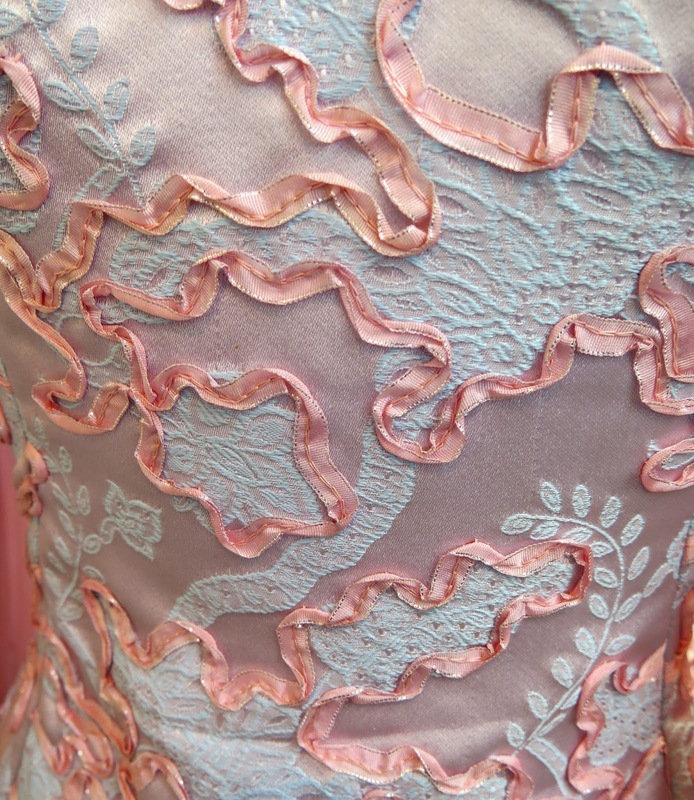 Just look at the gorgeous ribbon detailing!! Luxurious fabrics and stunning details are part of the reason I love vintage clothing, particularly pieces dating from the 30's - 60's. Apparently rompers are big this year (one piece with shorts - romper, one piece with full-length pants - jumpsuit) as we found quite a few on the racks. 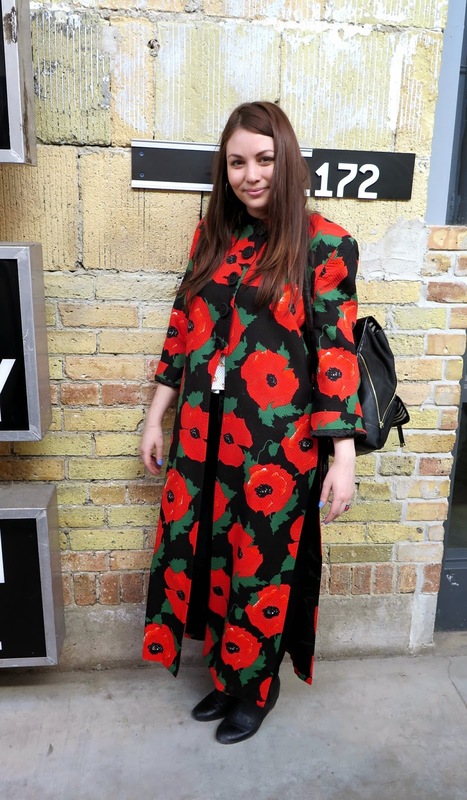 This one at Factory Girl Vintage was hands-down the coolest one at the show (many thanks to Suzanne for putting up with being asked repeatedly "can you hold this while I take a photo?"). The sleeves are open along the top with ties at the shoulder, elbow and wrist. I'm wishing now that I had tried it on, because really, when is that opportunity going to come up again? 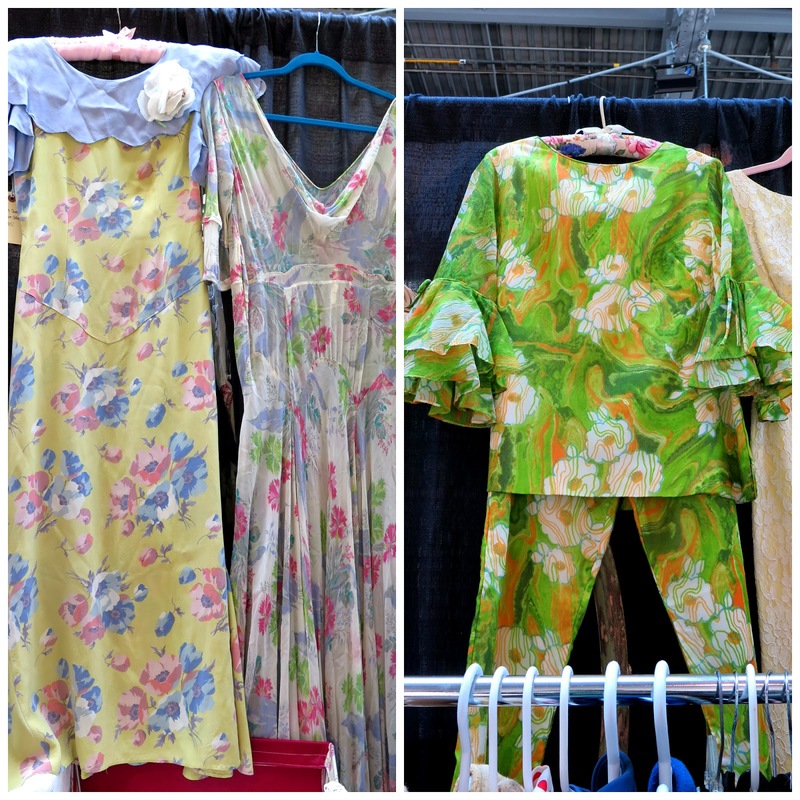 More rompers - Robin Tillmanns of Factory Girl Vintage holds a quilted cotton one, and the one on the right with the racy side cut-outs from Wild Thing Vintage. 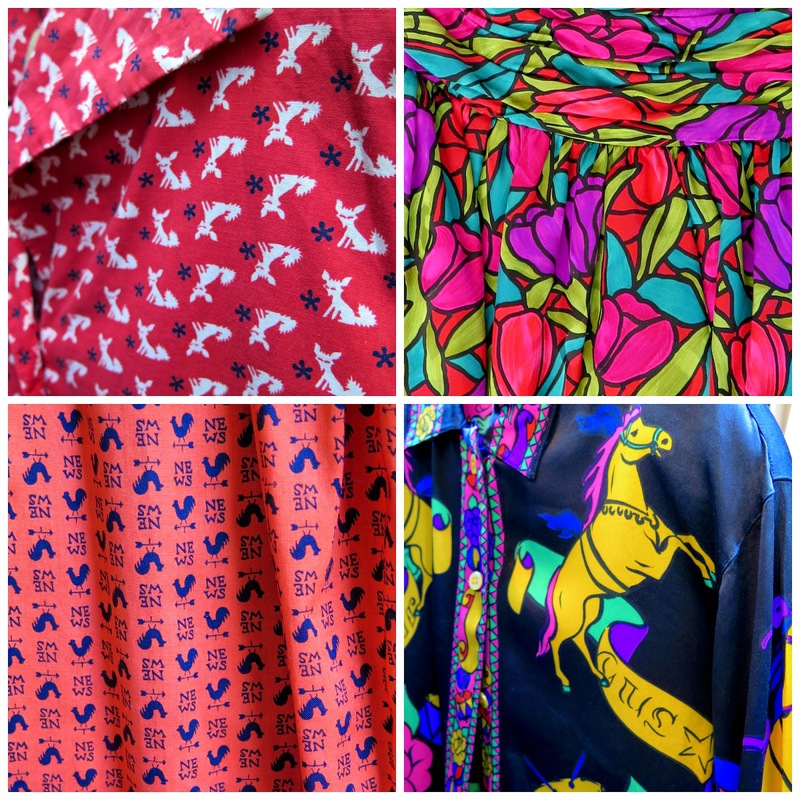 I saw this young woman trying on this amazing bold print opera coat from Wild Thing Vintage and she decided it was coming home with her. This young lady was the coolest gal at the show. 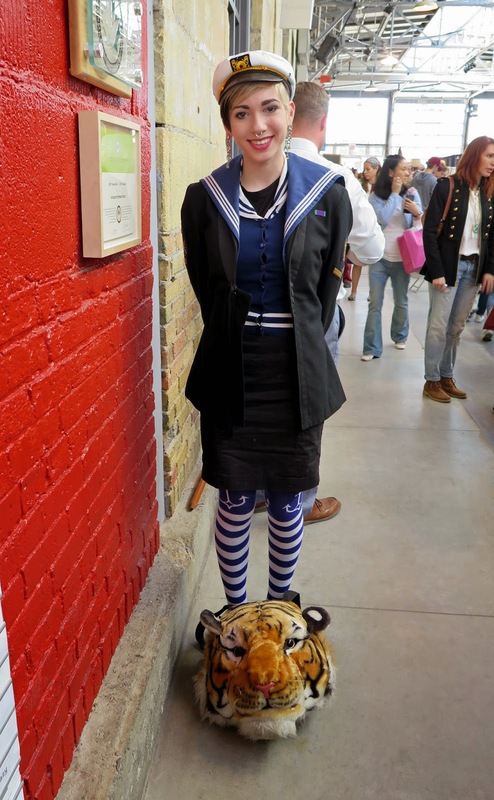 Her sailor-themed outfit was just adorable, and if that wasn't enough, the extremely realistic tiger head at her feet is her backpack ( I couldn't stop thinking of Richard Parker from The Life of Pi). 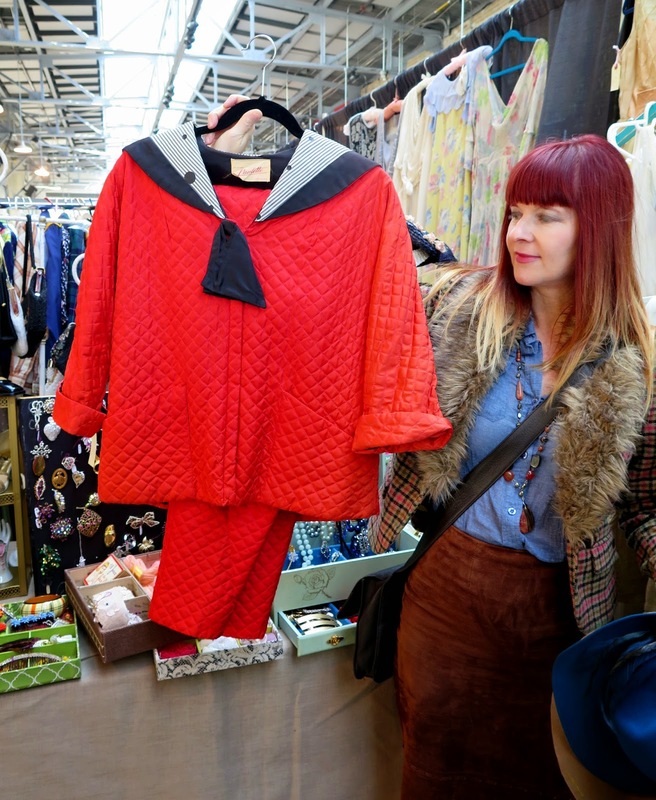 She found the sailor's jacket at Factory Girl Vintage at the show and it fit her perfectly. I asked Suzanne to take a photo of me with actor, antiques expert, props supplier and charming guy, Yank Azman. He was one of the first people I talked to when I started coming to the Gadsden's show a few years ago, and I took his photo, wearing the same hat, and same gangster face in 2012 (you can see it in my post from that show here). He's been very supportive of my blog over the years, forwarding my posts about vintage shows to other vendors, etc., which I greatly appreciate. After a light lunch we visited our respective favourite bakeries in the neighbourhood. 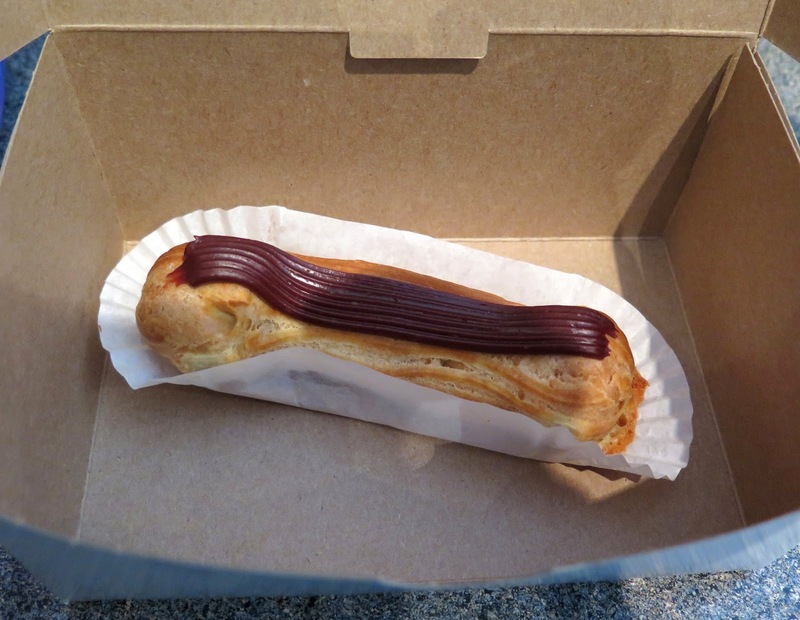 I made my annual pilgrimage to Leah's Bakery for some of their chocolate peanut butter Rice Krispie squares while Suzanne picked up some eclairs from Pain Perdu Patisserie. She raved about them, so I had to try one, and it was as delicious as promised, and they are small, with real custard filling, as opposed to those giant, edible oil product-filled things you can find at doughnut shops. A thoroughly enjoyable day of shopping, eating and socializing came to an end and I reluctantly returned home. Until next time! wonder if that red quilted outfit are sailor pj's? I love Suzanne's face with the red quilted outfit - "Are you contagious?" What a curious piece. Could be PJs, or lounge wear? Too bad you didn't try on the yellow romper, Shelley. I love that thing. What a great visual blast that show must have been, to see so many people with irrepressible style in one place, along with the clothes and accoutrements that keep them going. I'm jealous you guys got to hang out. Mr. Azman is a cool dude; looks like he's ready to whack someone. I hope he gets lots of acting jobs. Oh, you lovely people! 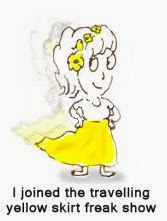 Sweet adventure, what a treat. 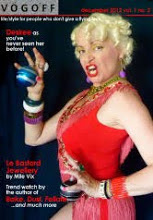 Ooh, two of my favourite bloggers together - the fair might have imploded with your fabulousity! What fun that looks like! I love seeing the other people in these fairs. 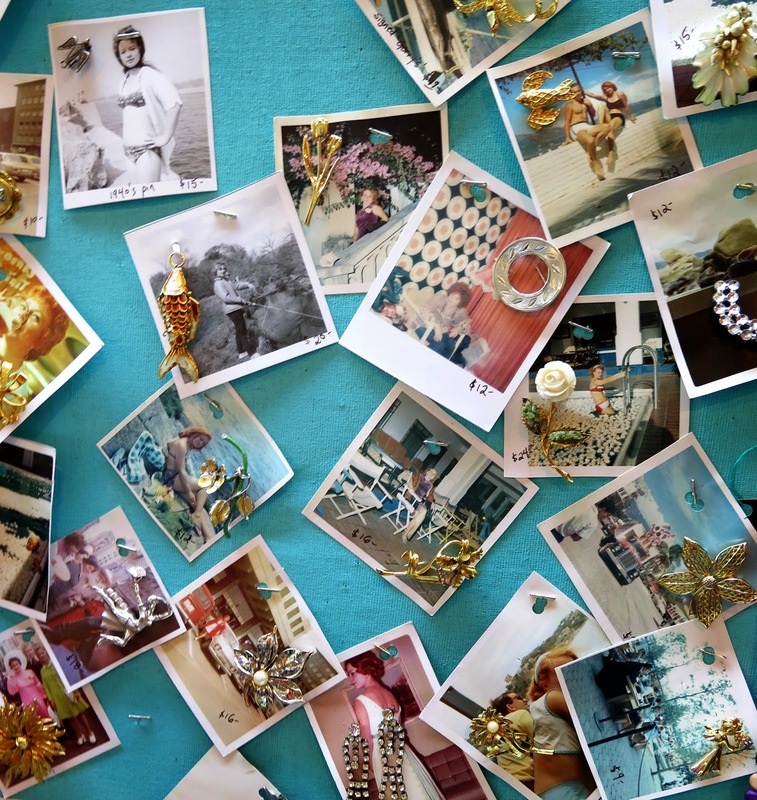 I would have snatched up those horsehair brooches - love that mod shape. 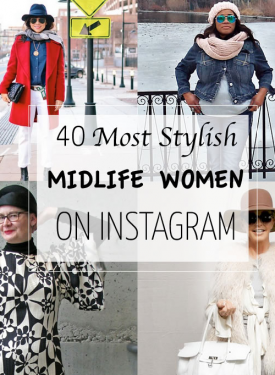 How fab is this, two bloggers for the price of one? You both look gorgeous, I'm loving your jade dress, I lived in that colour in the 1980s and I rarely come across it now. I'm dying with lust over the green trouser suit, the opera coat (hope she bought it), the playsuit and that floral mini with the huge zip. That strange quilted number Suzanne's holding, I can see Diana Rigg wearing in Murder Under The Sun. How lovely to see the two of you together, looking gorgeous! It was a great time! Thanks for inviting me along. You got some wonderful photos here Shelley. So glad we were able to get out and enjoy the day. I love the tiger backpack the best! Too bad it already has an owner. Looks like you two had tons of fun together! Loved this post, Shelley. 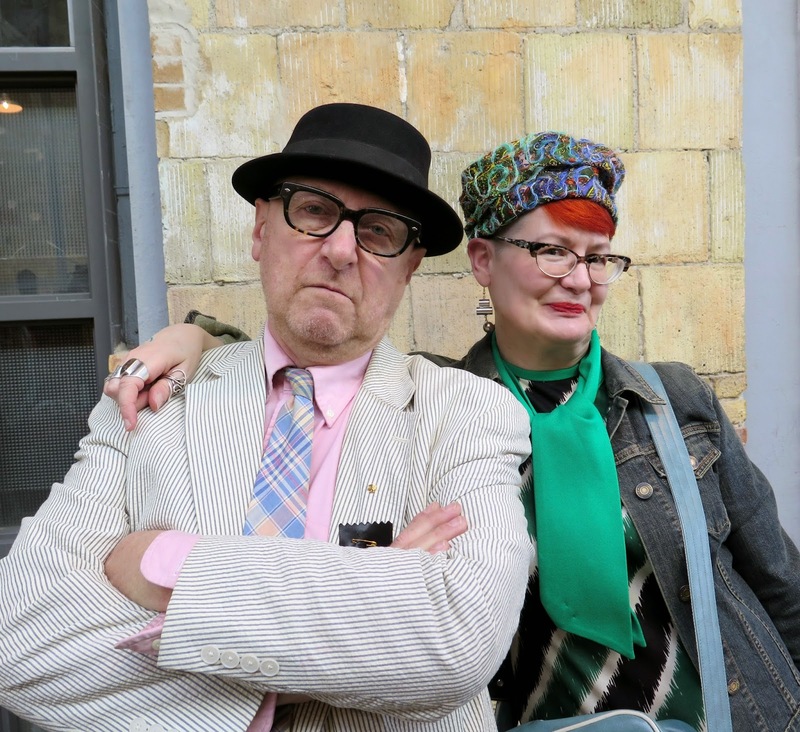 You and Suzanne really know how to do a vintage show in style, selecting the cool stuff and wearing the perfect hats. Looks to me like you're in the process of creating a hat room! Looks like a lot of fun. The colors and prints make me smile. Late to the party, but I love this post. 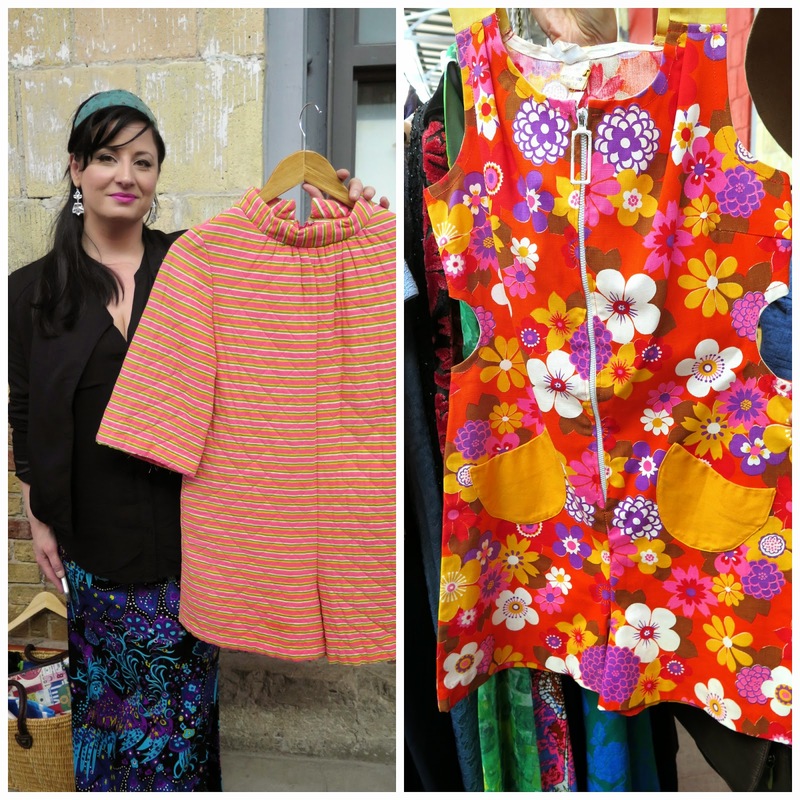 One of the nicest things to do.... visit a (vintage) clothes sale with a friend. Wishing you had more time and money. Life is perfect when it is slightly imperfect. Now that I go over this post again, I notice the horse hair flowers: GORGEOUS, I want one. And the plastic bracelets are so cool too.